The Penguins went through a hard practice this morning at southpointe and the battle level was excellent from the players as the team went through preparations for tomorrow’s contest against the Atlanta Thrashers. Winger Arron Asham told me after practice that the battle level the players have and the uptempo pace being dictated by head coach Dan Bylsma is leading to success on game nights. 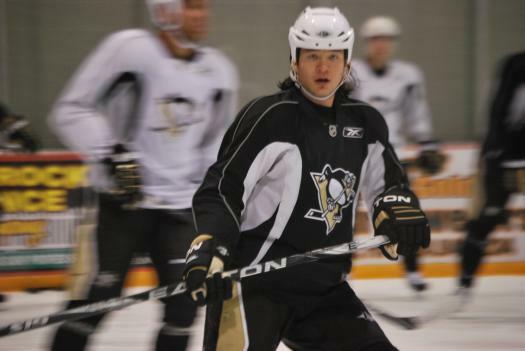 Asham returned to practice after missing Monday’s game due to an illness. Asham told me today that he had a combination of a chest infection and stomach flu and that it wasn’t pretty. The Penguins No. 1 ranked penalty kill unit (90.5%) will put their penalty kill streak on the line Thursday night as the Penguins have killed off 32 straight penalties. “You know what it’s a group effort, being on the same page and willing to make the sacrifices that you need to get a kill and obviously you can’t do that unless you get great goaltending and our goalies have been unbelievable shorthanded and kudo’s to them, ” Matt Cooke said. The Penguins are winning games the way management thought they would when assembling this team during the off-season. One Penguins defenseman whose been around for quite a while said today that this is the best defensive unit and system put in place during his time in Pittsburgh. The defensemen believe the philosophical change to having a defensive system in place especially when protecting leads is also impacting more success for the forwards at the offensive end. Personnel also has a part in this too as I get the sense just about everyone in that locker room feels Paul Martin has been an upgrade over Sergei Gonchar. Evgeni Malkin who leads the NHL with 115 shots but only has 8 goals continues to be a hot topic in Penguins circles. Those in Penguins circles believe he’s getting close to breaking out. Crosby who has played with Malkin a lot of late in certain situations, feels Malkin’s impact has been solid as he’s doing the little things that don’t show up on the stat sheet. Forward Mike Comrie was around the facility getting treatment working out and getting treatment. He should be back on the ice later this week. Head coach Dan Bylsma spent a good 3-to-4 minutes giving Ben Lovejoy instruction on the side as practice was winding down.